The compost pile as it stood on Wednesday morning. 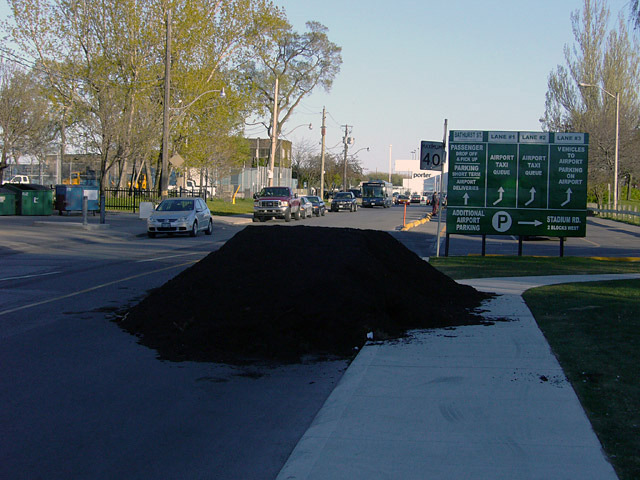 Ordinarily, a pile of dirt dumped in the middle of a roadway would not be cause for elation—just the opposite. 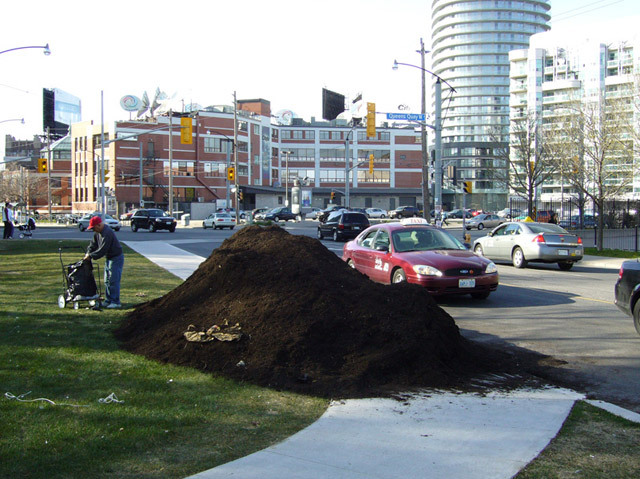 But some of the people who live in the Bathurst Quay neighbourhood were celebrating Wednesday, after the city dropped off its annual load of free compost in the middle of an illegal Eireann Quay taxi lane, rather than its usual spot in a nearby park. Eireann Quay is the street formerly known as Lower Bathurst, and it’s become a sort of impromptu taxi stand for cabbies looking to pick up fares at Billy Bishop Airport. Some neighbours say the taxi drivers are snarling traffic, fouling the air with their constantly idling engines, driving on the grass, urinating behind trees, and generally making a nuisance of themselves. The compost pile, moved by Thursday. In the meantime, Vaughan and Councillor Howard Moscoe (Ward 15, Eglinton-Lawrence), who chairs the licensing committee that oversees the taxi industry, have been working to get the taxis off the street. On Thursday, Moscoe told us that he’s working with the Toronto Port Authority, Porter Airlines, and the city’s Parking Authority to come up with alternatives to the Eireann Quay taxi stand. He’s proposing that the city set up a “marshalling area” that’s close enough to the airport to keep the cabbies happy, but far enough away that they won’t upset the residents. He’s narrowed it down to three sites, all of them under the Gardiner Expressway, between Spadina and Bathurst. How close are we to a final decision? The plan’s still at “the discussion stage,” he says. 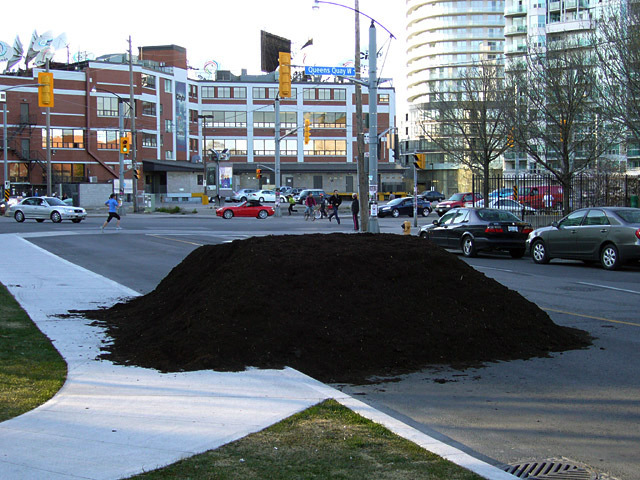 Just as long as it’s not composting.